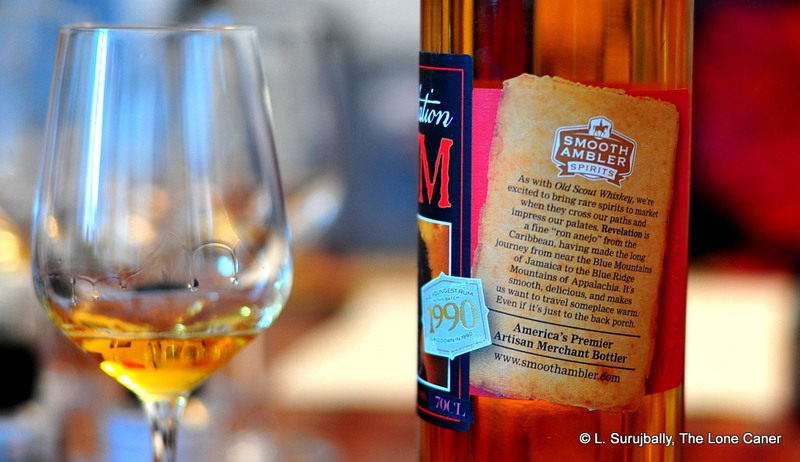 The stats and the label speak to a rum that can almost be seen as extraordinary, which usually fills me with dread as a reviewer: for, how could any rum live up to that? I mean – from Jamaica in the 1980s, 33 years old, a cousin to another really good rum from there, bottled by an old and proud indie house…that’s pretty impressive, right? Yet somehow, against my fears, Berry Bros. & Rudd have indeed released something special. 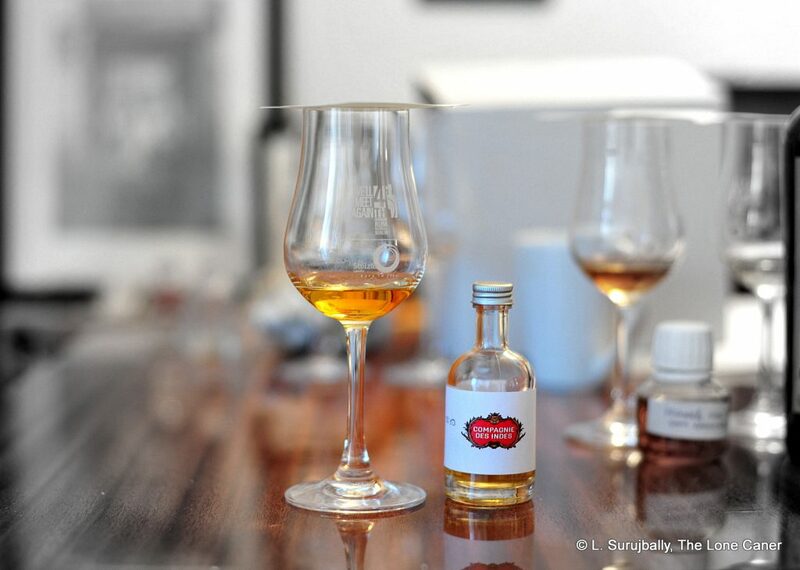 The initial tasting notes could come from any one of a dozen rums, but as it develops and moves along, it gains force, and we see a great original product coming into focus, something we have perhaps tried before…just not often done this well. 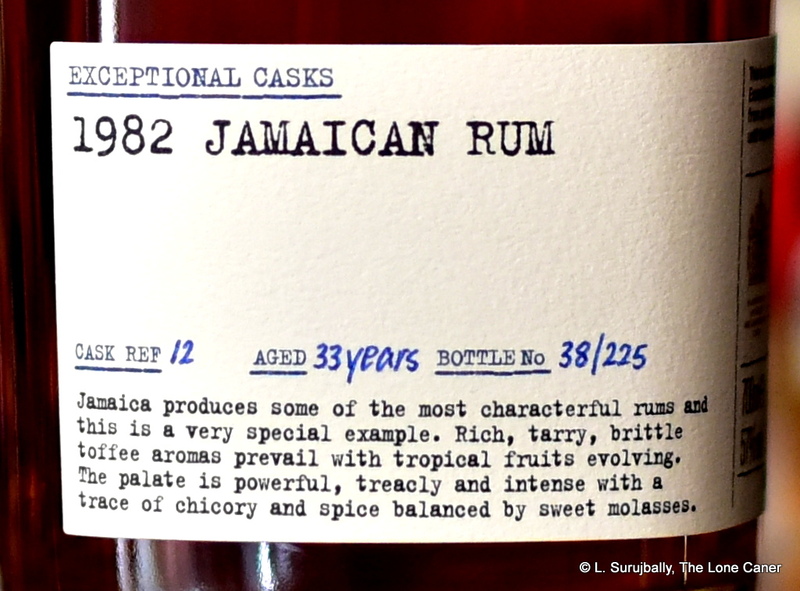 BBR, you will recall, issued the 1977 36 Year Old Jamaica rum which was one of my more expensive purchases many moons back, and it was a great dram. 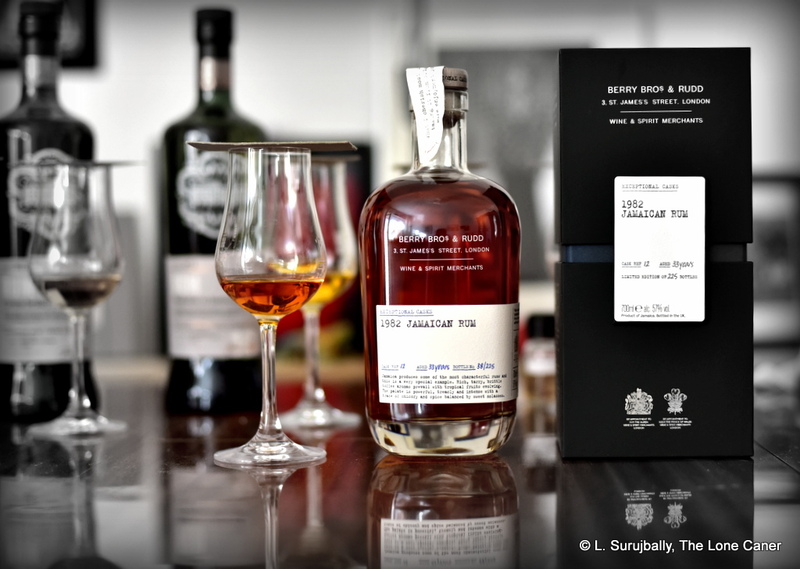 Fast forward a few more years and when this 1982 33 year old “Exceptional Casks” old rum – also from an unnamed distillery – came on the market, I hesitated, hauled out my cringing wallet and then took the plunge. Because I believe that the days of easily and affordably sourcing rums more than twenty years old (let alone more than thirty) are pretty much over, and therefore if one wants to own and try rums that are almost hoary with age, one has to snap ‘em up when one can….as long as the purse holds out. So, what do we have here? A dark amber rum, 57% ABV, one of 225 issued bottles, in a handsome enclosure that tells you much less than you might wish. Pouring it into a glass, it billows out and presents aromas of dark fruits, well polished leather, pencil shavings, prunes, pineapples, and a whiff of fresh, damp sawdust. This is followed by a delectable melange of honey, nougat, chocolate, molasses, dates, figs and light red olives, and as if that wasn’t enough, it burped, and coughed up some very ripe apples, raisins and the musky tartness of sour cream….an hour later. Really complex and very very aromatic. The real party starts upon tasting it. It’s smoothly and darkly hot, begins quite sharply, revving its engine like a boss, then apologizes and backs off from that dry and heated beginning (so sip with care at the inception). You can taste leather, aromatic pipe tobacco (like a port-infused cigarillo), combined with softer hints of brine, olives, and dark unripe fruits. Not so much funk or rancid hogo here, quite tamed in fact, which makes it a phenomenal sipping drink, but in that very subdued nature of it, it somehow feels slightly less than those feral Jamaicans we’ve started to become used to. It’s got really good depth, lots of flavour and to mix a rum this old and this good is probably an excommunicable sin someplace. Lastly, the finish does not let down, though it is somewhat subdued compared to everything it showed off before – it was initially hot and then calmed down and faded away, leaving behind the memory of pineapples, ripe cherries, brine, sweet olives, raisins, with a last touch of molasses and caramel lurking in the background like a lower case exclamation point. To my mind, it is very likely from the same stock as the other 1977s that exist (the other BBR and for sure Juuls’s Ping 1977) because much of the profile is the same (and I know that because I went downstairs and fetched them out of mothballs just to cross-check). Facts say the Ping is from Long Pond and scuttlebutt says the BBR is as well, which may be true since the hard-edged profiles of the high-ester Hampden and Worthy Park rums don’t quite fit what I was sampling (however, the question remains open, and BBR aren’t saying anything, so take my opinion here with a grain of salt). Both rums were aged in Europe and while I know and respect that there’s a gathering movement about favouring tropical ageing over continental, I can only remark that when a rum aged in Europe comes out the other end 33 years later tasting this good, how can one say the process is somehow less? It stands right next to its own older sibling, bursting with full flavours, backing off not one inch, leaving everything it’s got on the table. What a lovely rum. When a bunch of the rum chums and I gathered some time back to damage some rums and show them who was boss, one of them remarked of this rum, “Easy drinking” — which initially I thought was damning it with faint praise until I tried it myself, and continued with it three or four more times after they all staggered back to their fleabag hotels, surprised by its overall worth. It’s not often you get to try (or be really pleased by) an indie bottling from the USA, given how much they are in love with starting whole distilleries rather than sourcing other people’s juice. That out of the way, tasting notes. Nose first: take your pick on the terms — rancio, hogo, dunder, funk — it’s all there. Rich and sharp fruits. Red currants, pomegranates, rotten bananas and a milder form of fruits thrown on the midden that haven’t completely spoiled yet. Caramel, vanilla. I actually thought it was a muted Hampden or Worthy Park, and it was only after it opened for a bit that other aspects came forward – vanilla, caramel and some tannics from the oak, which is not surprising since part of the blend comes from (what is assumed to be) 75% Appleton’s column distilled 1990 stock (so 23 YO, given this was bottled in early 2014) and another 25% from a pot still dating back, according to them, 1985. No idea where it was aged, but for its richness, I’d almost say tropical. Palate and nose diverged rather markedly in one key aspect – the characteristic Jamaican funk took a serious back seat when I tasted it, and became much more balanced, really quite approachable, if losing somewhat of its individuality and craziness that so characterizes Jamaican high-ester screamers. Some of the acidic fruits remained – green apples, sultanas, cider, bitter chocolate, vinegar — but with some attention one could easily discern soy, olives and brine as well, to say nothing of sweeter, softer fruits like tinned peaches and apricots in syrup. Plus maybe a bit of cumin, smoke and lemon peel. There is a layer of nuttiness, caramel and toffee underneath all that, but it serves more as a counterpoint than a counterweight, being too faint to catch much glory. Much of this stayed put on the finish which was soft yet spicy, just on the rough side of being tamed completely, with cumin, nuts and fruits closing things off, perhaps without bombast, but at least with a little style. It’s a tough call, what to think of something like this. The balance is good, and oddly enough it reminds me more of a Jamaican and Cuban blend than a meld of two Jamaican houses. The strength at 49.5% is also spot on, residing in that pleasant area that is more than standard strength without tearing your tonsils out as a cask strength sixty-percenter might. There’s a lot here that a bourbon fancier might enjoy, I think, and while it won’t take on the big Jamaican players we now know so well, it’ll give a good account of itself nevertheless. I thought it an interesting rum and a very sippable dram for those who want to try something a little different, and as I finished my fifth glass, I could only think that yes, my friend was right when he said I had to try it; and that it was a crying shame Smooth Ambler didn’t care enough about rums to follow up with what they had achieved on their first go through the gate. Both the Rum Barrel (on Facebook) and The Fat Rum Pirate commented on its excessive oakiness, but I felt it was just fine myself. In the previous review of the Florida Caribbean Distillers industrially-produced Florida Reserve 2 year old rum, it was treated and written about with some disdain, because as far as I was concerned, it had nothing to make it stand out at all. It was a low rent mass-produced column-still rum that did exactly nothing to distinguish itself and could at best be used to spike a drink with alcohol, without leaving any trace of itself behind, not even a grin. Move on now to another minimally aged rum marketed to the masses, cheaply priced, easily available (at least, in Toronto, which was where I sourced it), and you can see what a difference there is. 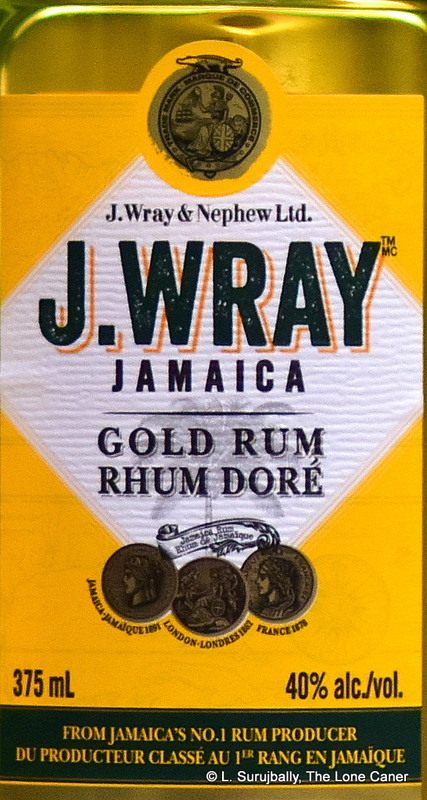 I’m not talking about intrinsic quality so much as distinctiveness; nor do I contend that the J. Wray Gold is some kind of hidden masterpiece, because it rubs shoulders in the same sort of downmarket liquor store shelves where you might find the Reserve, and is a mass market rum just like it….but does have its points. 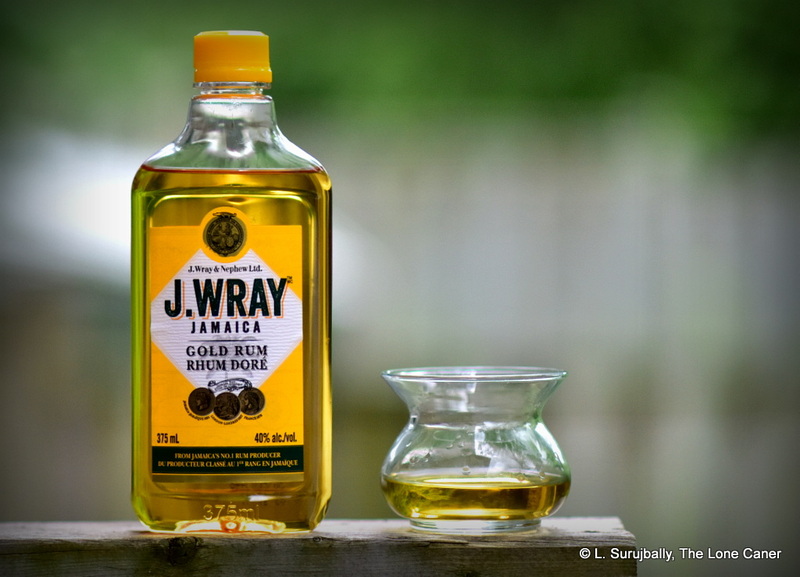 The J. Wray Gold is nothing particularly new – for years it was sold as the Appleton Special Jamaican rum, and this new version got issued in 2016 as a rebranding effort (though why they bothered escapes me – maybe it’s to distinguish it from the slightly more upmarket Appleton range of rums). For what it’s worth, I tried them side by side, and felt they tasted somewhat similar, scored somewhat similar, but were definitely not the same – so the recipe was likely tweaked some in the rebranding. 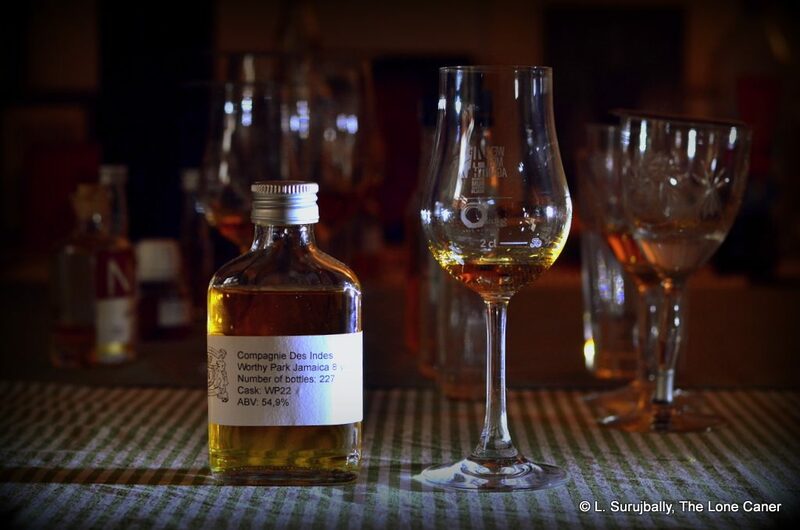 What is also peculiar is that there is actually not much information available on what makes it up: the most I can ascertain is that it’s a mix of pot and column still distillate, 40% ABV, and (my opinion) is probably very young – maybe two years old or so, maybe even less. I make this last observation because of its unrefined nature. Even at standard strength, it noses rather raw and jagged, even harsh. There are initial aromas of light glue, rotten bananas and some citrus, light in tone but sharp in attack. It also smells a little sweet and vanilla-like, with vague florals, apple cider, molasses, dates, peaches and dates, with the slightest rtang of burnt rubber coiling around the back there somewhere. But it sears more than caresses and it’s clear that this is not a lovingly aged product of any kind. It is, however, somewhat more distinct on the taste. The sharp and uncouth nature doesn’t abate, that’s a given, and funky notes persist – rotting fruit, ripe landfill steaming after a tropical rain (yeah, I know what that sounds like), overripe fruit and bananas, honey, brine, vanilla and some molasses and caramel. It’s not very well integrated and though I mention these flavours, the truth is that they are still underwhelming (a function of the strength) and the roughness on the tongue makes it unsuited for any kind of sipping drink. The finish is unspectacular- short, salty, nutty with some citrus and vanilla thrown in, and overall, very faint, quickly gone. This is not a ringing endorsement by any means — I can’t say I cared for it, really. But for good or ill, it was a rum you couldn’t easily forget once you tried it because of those very same attributes. It excites opinion, not indifferent yawns. Sure it’s a rough ‘n’ ready backcountry bottom-feeder, perfect for a pick-me-up hip flask to be taken into the dodgy areas of Scarborough when you’re liming with your squaddies down at the local rumshop. It’s cheap, it’s raw, and doesn’t pretend to be anything other than an entry level hooch. Yet at the same time you can sense the nascent quality it has, which emerges more fully as you work up the line of the company’s products. It has something, some small spark of artistry, of appeal, of uniqueness. Poor as it rates next to pricier upscale rum from J. Wray / Appleton, it does show what some distillation chops and blending ability can bring to the table with a set of people who know what they’re doing, even at the bottom end of the range. Oh sure it won’t class with an aged Hampden or Worthy Park, and I think even the V/X exceeds it. So okay, it fails, maybe….but to me, it fails with authority. And that’s why, though scoring them almost the same, I would prefer an honestly made piece of dreck like this, over something more smoothly anonymous like the FCD Florida Reserve. Until Velier came along last year and produced that incredible Long Pond Quartet, you would have been hard pressed to get much from that distillery, which sent most of its stock overseas to age and be issued by others. Much of their production was placed into blends, and occasionally a small single cask release would be spotted on the market – the Juuls Ping 9, BBR 1977, Compagnie’s 2003 12 YO, Rum Nation’s 1986 Supreme Lord VI, the snarling 81.3% bronto of SMWS R5.1, and, of course, greatest of them all, the near legendary G&M 1941 58 year old. Now, we hear a lot about E&A Scheer these days, but that doesn’t mean other bulk importers don’t exist in Europe. One of these is Rum Albrecht GmbH, a north-German subsidiary of the family owned Heinz Eggert & Co, which is an importer and exporter of distillates, spirits, aromatics essences, alcoholic raw materials, wines and liqueurs for over sixty years. 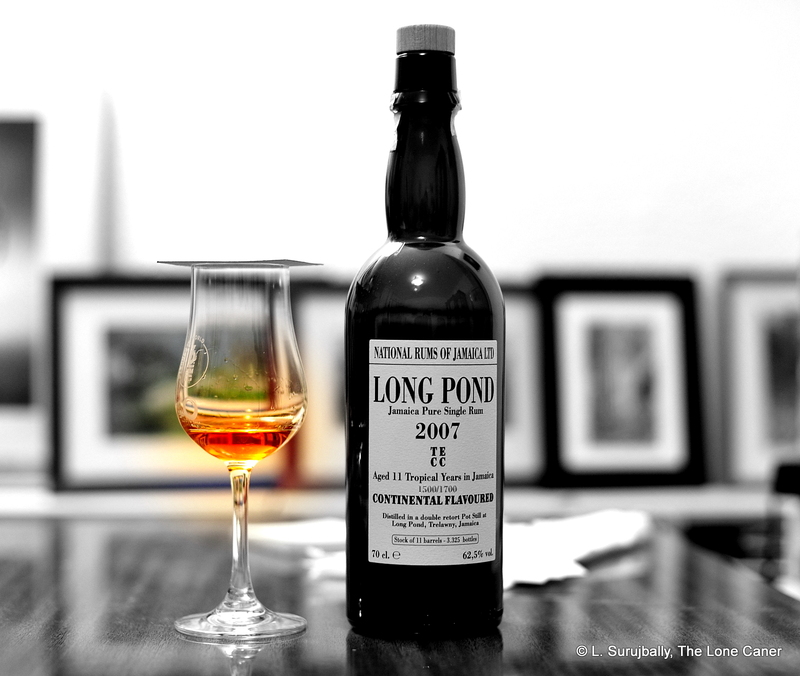 Since working with aromatics and rums leads directly towards high ester rums, perhaps it’s no surprise that as of 2004 they began releasing limited editions of the “LPS” series of rums from Long Pond, and have thus far produced several: an 11 YO, a 13 YO, a 17 YO and an 18 YO , all from the distillation year of 1993. Unfortunately, that and the strength (53% across the range) is about all the information easily available — the label is a masterpiece of nothing-in-particular, really. Flo of Barrel Aged Thoughts noted in his 2013 review that the rum was imported from and fully aged in Jamaica and simply bottled in Germany, with a release of 342 bottles, and he also remarked on it being a pot still distillate, (said info provided by RA themselves, since the label mentions nothing of the kind). So okay, we have that. But none of that really mattered, because when tried in concert with several other Jamaicans, this thing shone even without knowing precisely what it was (at the time). It was so different from the Ping 9 as to be a different rum altogether, and seemed to share DNA more with the 1941, or even a Hampden than anything else. Its nose began with rubbery, waxy and lots of clear fruity-estery notes and then proceeded into aromas of cream cheese and chives, cereals, honey, lemon peel and cumin. And as if it got bored with that, after an hour or so it coughed up a few extras for the patient, of cardamom, overripe bananas and sour cream, all very crisp, very aromatic, a veritable smorgasbord of Jamaica. The taste was similarly complex: while initially a bit sharp, it calmed down rapidly and glided smoothly across the palate, and the first notes I made were about rough black bread and cream cheese, brine and olives and many of the bits and pieces carrying forward from the nose. Vanilla, caramel, toffee, plus cumin, freshly sawn cedar planks, nougat, almonds and a hint of smoke and leather, with an excellent, long-lasting finish that summed up everything that came before – mostly brine, rubber, cedar, nuts and sharper fruits (apples, green grapes and firm yellow mangoes). I know Jamaicans from the old and famed distilleries can have bags of flavour, but honestly, the assembly of this rum was nothing less than outstanding. What’s even more surprising about the rum, is how under-the-radar it was when it was released in 2013 (and continues to be, now – I mean, have you ever heard of it?). Granted, back then the Jamaican rum renaissance was just beginning to get a head of steam, the Velier Hampdens and the Long Pond Quartet were just glints in the milkman’s eye, and all was somewhat overshadowed by the burgeoning reputation of Foursquare. But a rum like this, from the 1990s, 17 years tropical ageing (another thing that hadn’t quite taken off back then), from Long Pond? It should have been lauded from every hilltop and rumfest in sight and disappeared off the shelves faster than you could say “Was zum Teufel?” in Jamaican. My own feeling is that Albrecht didn’t really understand what they were sitting on and released it to the German market without much fanfare, and the story goes that some 10-15 far-sighted cocktail-loving people bought like 80% of the entire outturn to juice up their bars, and then it just sank out of sight in spite of the German reviewers’ praises. Well, there probably isn’t much of it remaining after all these years, and I’ve never seen one go up for sale on the auction sites of FB sales pages. But I know that if it ever does, I’m buying one, and I sure hope Albrecht has squirrelled away a few more like it for future release to the Faithful. Hampden has been getting so much press of late that it’s only fair to have a look at the other products of the island, of which, these days, there are no shortages. For a long time these distilleries — with names geeks could recite in their sleep, like New Yarmouth, Innswood, Clarendon, Long Pond Monymusk, Worthy Park, Hampden — laboured in relative obscurity, living in J. Wray’s gargantuan shadow, selling mostly bulk rum abroad, or for the local market. Most of the time, such bottlers never bothered with identifying the distillery of origin. Often it was just “Jamaica rum” and that was it. But in line with the recent interest in stills and distilleries (which perhaps originated in the Age of Velier’s Demeraras), the independents became more forthcoming with where their juice originated on the island. 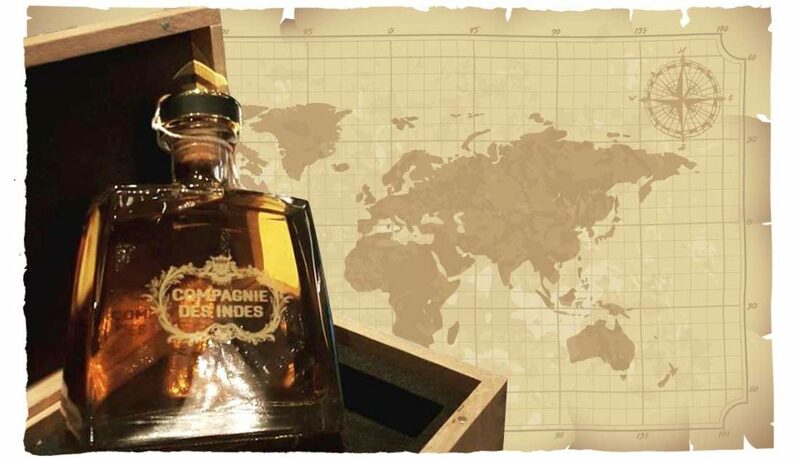 This brings us to the Compagnie des Indes, founded in 2014 by Florent Beuchet, who, with the exception of their blends like the Dominador or Caraibes, has always placed rather more information than less on the labels of their rums – including that first set of cask strength bruisers marked “Denmark only”, which have caused nerds conniption fits and allowed the lucky Danes to preen unashamedly while glugging their personalized full proof juice. This one, distilled in 2007 (the first year of WP’s re-opening after being modernized) and bottled in 2016 at a solid 54.9%, was continentally aged and limited to 307 bottles, all of which ended up in Denmark. 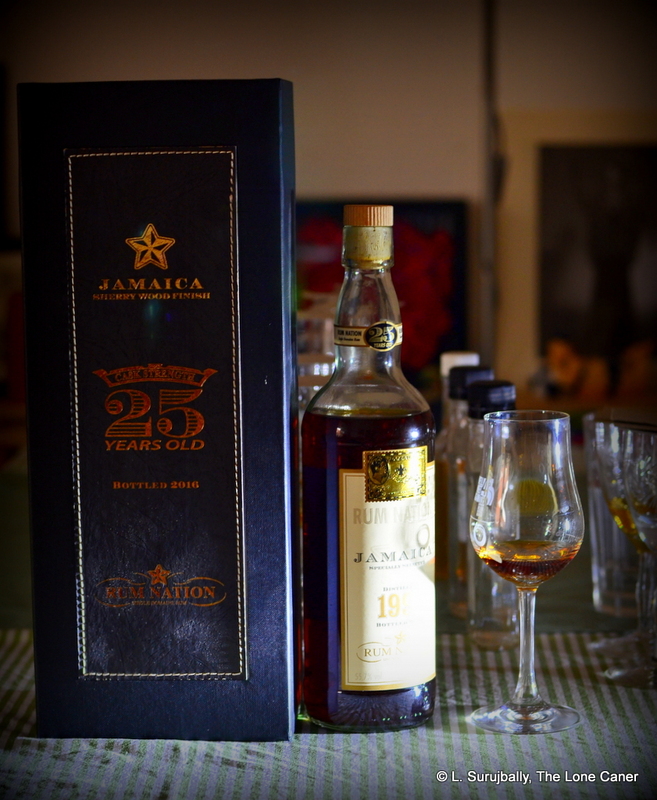 Trying the rum in 2016, against its spectacular 7 year old brother (also from WP’s 2007 output) and again for this review, I was reminded how full proof Jamaican rums seem to step up their game and be ahead of living room strength rums by a country mile. It was lighter on the nose than the RN Supreme Lord 7 and Supreme Lord 8 which were also on the table that day; slightly funkier too, though restrained compared to the rutting jocks of the Hampdens or NRJ rums. Aromas of honey, dates, apricots, tart soursop and green grapes mixed it up nicely with some brine and olives, and a sly hint of flowers emerged after adding a few drops of water. The palate was where it shone. It was warm, spicy and very clear, tasting immediately of brine, light nail polish remover, and also of lemon sherbet and mango ice cream. It presented firmly on the tongue, somewhat sharp without any jagged edges of confusing or conflicting tastes; as it opened it provided flavours of paint thinner, varnish and sweeter acetones, accompanied by light funk, vanilla, slightly bitter oaky tannins, which were in their turn superseded (but not eclipsed) by some caramel and brown sugar, dill and lemon zest. Really good balance, really well put together. It ended with a delightfully long and cruising finish, warm and solid, providing mostly tart background notes of half ripe mangoes, peaches, some caramel, and the vaguely bitter strength of some very strong black tea sweetened with condensed milk. Worthy Park rums are interesting variations on the Jamaican style. Appletons are well made, elegant blends with a laid back sort of profile, while Hampdens are fiercely luxurious funk bombs, and Monymusk and New Yarmouth seem to exist on another plane of existence altogether (perhaps because they are relatively less well known). Worthy Park rums, though (those that I’ve tried, anyway) are light, crisp and clean, ester-rich, with delicate and precise lines of commingled flavour coiling through each and every one of them, only occasionally exploding into something more aggressive, and usually resting on a softer background that makes for a lovely sip. Now, their own new tropically aged rums issued over the last few years are small masterworks (I think), yet we should not ignore the sterling efforts of the choices the independent bottlers made either, both before and during the current Jamaican Renaissance. This excellent rum is a good example of why that statement can be made, be absolutely true, and it burnishes and elevates the reputation of a distillery that is finally getting the respect it should have had long ago. I’ll be trying quite a few more of their rums in the months and years to come, that’s for sure. For further reading on Jamaican rum distilleries, a good starting point is The Wonk’s Jamaican Cheat Sheet. 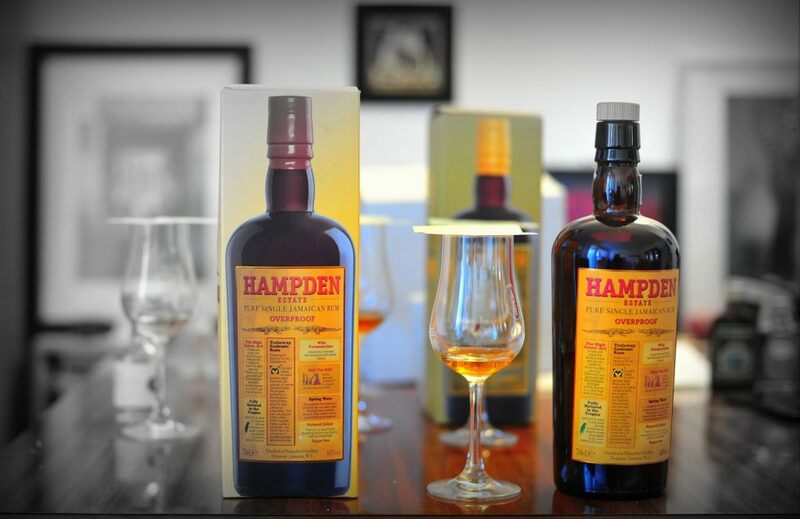 My own personal memories of the Hampden Overproof will always be combined with the Tasting of the Century in London, where we tried those magnificent old rums the Harewood 1780, St James 1885, Bally 1924 and Skeldon 1978…and the two new Hampdens. Truth to tell, my focus was so fiercely on that geriatric quartet, that I had little time to pay attention to the twins….time kind of ran out on me, and I could barely do them justice. So knowing I had the bottles in Berlin, I waited until October and then dealt with them there again. Velier, as is now quite well known, has dibs on the distribution of Hampden rums from 2018 (and, I think, 2019) through their new organization of La Maison & Velier. Both the 46% and the 60% versions of the rum are the same, the former just being diluted down, so in this review I’ll be talking about the overproof version, although the notes are the same for either, with the strength being the only true variable. Technical schtick for the rum curious: what we have here is a rum based on fermentation with wild yeast, distilled in 2010 on a double retort copper pot still; the ageing was fully tropical for eight years and it was bottled in 2018; the level of esters was not disclosed except insofar as to note it was “very high”; and of course, no additives of any kind, not sugar, not colouring, nothing. All of which, by the way, is on the hugely informative label that in its graphic detail is somewhat at odds with the famed Spartan labels of yore, but never mind. One thing that isn’t on the label is the outturn, but the source was 31 barrels, so assuming a 6% angel’s share per year, we can estimate that around 10,000 bottles were released into the global market. What always surprises me about Hampden rums is how relatively restrained they are, irrespective of the strength. You expect that say, from an exquisitely blended Appleton, and certainly do not from Zan Kong’s Worthy Park offerings which cheerfully lunge out of the bottle like a hungry face-hugger, yet Hampdens find a sweet spot between the two that is nothing short of delectable. The nose is a combination of soft and crisp, initially redolent of pencil shavings, paraffin, varnish and sawdust, bitter chocolate, unsweetened cocoa, damp, freshly turned earth and tar, and, like many such strong rums, rewards patience as these aromas develop, and then fade. They are then replaced by green grapes, unripe mangos, and lots of sharper, unripe-but-sweet fruits, balsamic vinegar, sweet gherkins and a very nice background of aromatic tobacco and port-infused cigarillos. Ah, and the taste – really nice. Strong and bordering in sharp, yet even at 60% ABV it presents as amazingly controlled, even moderate. The tastes are all there, deep and intense, rolling easily and crisply across the palate, yet not so ester-heavy as might be inferred from the label. You’d laugh when I say that I tasted well-oiled leather and sweaty shoes, and then take comfort in more traditional flavours of brine, olives, maggi cubes, cardboard, black bread and cereals (there’s a sort of creamy aspect to the whole experience I found very pleasing), which formed a bed upon which dates, figs, crisp peaches and pears and mangoes rested easily, dusted over with a lovely hint of cumin and cinnamon and lemon peel, leading into a crisp, snappy finish that sumed things up nicely, mostly with sharper fruits and crushed hazelnuts, lemon zest and that odd bit of tar from the nose making a belated appearance (perhaps out of mischief). It’s possible that gently diluting the rum to about 55% from 60% might make it more approachable and an easier drink: for my money, it’s damn near perfect for what it is, a really well blended Jamaican which even Sandor Clegane might like, something that enhances the street cred of both estate and country. It requires, like all full-proof, dunder-squirting yardies, some patience; it’s a drink to savour, not swill, and is an exemplary rum in almost all aspects of its profile. 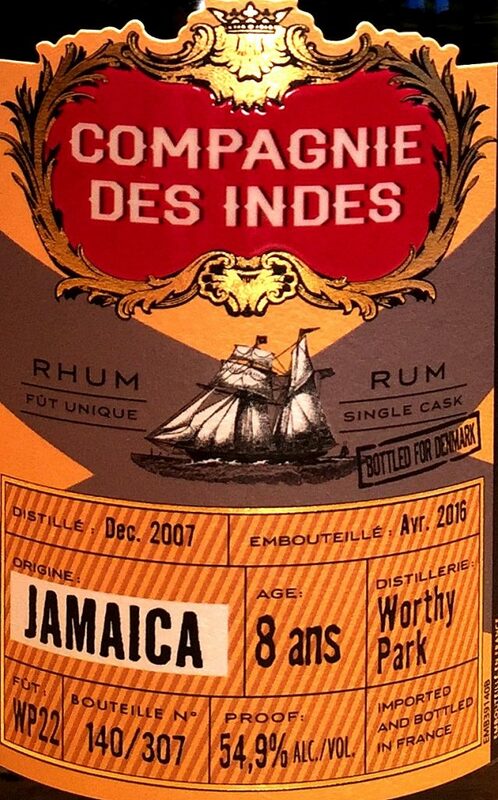 I’ve remarked on more than one occasion that my appreciation for righteously funky Jamaicans vacillates between Worthy Park and Hampden (though it must be acknowledged that Plantation is making inroads, and the Compagnie’s New Yarmouth rums also deserve a place at the table). It’s when you try something as powerful and tasty as this that you understand why the comparisons can and need to be made. 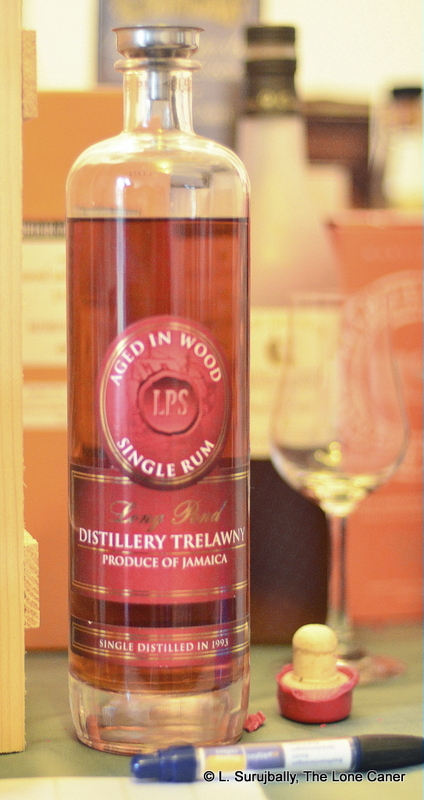 We are living in a Golden Age of new Jamaican rums, where pole position is being taken over and held by exactingly made blends produced by the distillery of origin, retaining all their unique heritage and profiles, rather than an unknown mix marketed under the uninformative sobriquet of “Jamaican rum”. 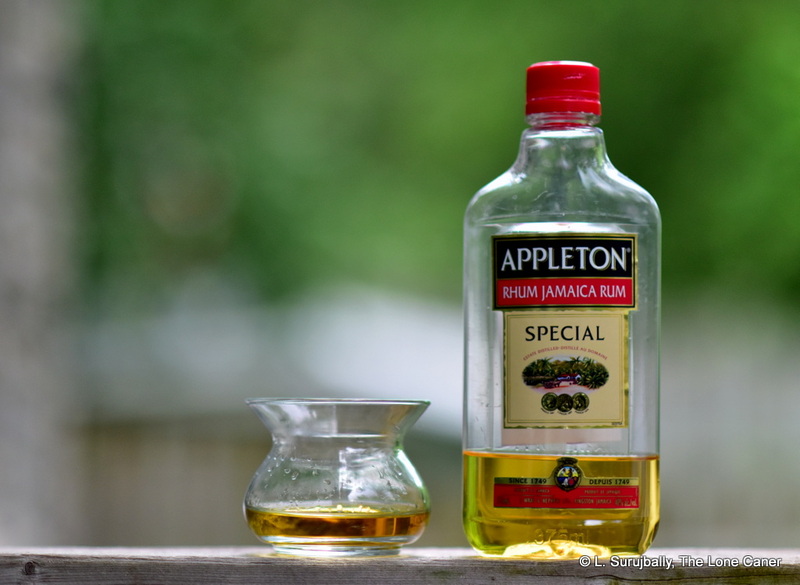 What seems to have happened is that after years and decades of somnolence, rum aficionados gradually got acquainted (or re-acquainted) with estate-specific rums from Jamaica that weren’t Appleton as a consequence of the efforts of the continental independents. Through the limited single cask releases of a few hundred bottles here and there, we began to recognize the individuality, the idiosyncrasy – the sheer dynamism – of Monymusk, of New Yarmouth, of Worthy Park…and of Hampden. That gradually-building groundswell of appreciation has turned into a roaring wave in 2018, and this edition of a really superlative rum is the result – thousands of bottles, not just a few hundred, all coming from Hampden, all made and developed and aged there, and meant for all of us who love the massive taste bombs out of the island. It is, in my own estimation, one of those rums whose reputation will only increase with the passage of the years, and to have tasted the first versions out of the gate was and remains nothing less than a privilege. Luca Gargano has made it clear that these are not Velier rums – his company is just the distributor. I chose to believe his fingerprints are on the bottles nevertheless, most likely in the selection of which 31 barrels made up the blend. However, in accordance with his wishes regarding attribution, I have not referred to this as a “Velier Hampden Estate Overproof Rum.” Though I think many of us harbour our own thoughts on the matter. There all sorts of fascinating things about this rum, whose age and rarity and limited outturn makes it almost impossible to find (and as for actually getting a full bottle? I dreams me dreams, kid). It’s aged more than thirty years. It was issued for the Hong Kong market. And it’s from Hampden, certainly one of the most interesting companies making rums in Jamaica today. Compagnie des Indes is one of those rare indie outfits that seems to be able to smell these oddly compelling forgotten casks squirrelled away in dusty warehouses someplace, and the only regret is that we can never seem to lay paws on them before they’re all gone (unless, perhaps, you’re Danish). You’d be hard pressed to do a search on this baby and find anything about it, so let me fill in some blanks that I got after emailing Florent Beuchet, the boss over the Compagnie des Indes, that French independent I’ve been following with great interest and affection for some years. It was of pot-still origin, distilled December 1983 and bottled in November 2017, so a whisker under 34 years old (when was the last time we saw something like that?). It was continentally aged, one barrel, and its origin came as a result of Florent meeting one of the biggest importers of Burgundy wines in Hong Kong, striking up a conversation and then partnering for this very unique release. In fact, it was special enough that the Compagnie eschewed the standard bottles and went with fancy decanters instead, exactly 250 of them (of which a mere 12 are being sold in Europe through a shop in Paris called L’Univerre Paris, the rest in Hong Kong) — each was apparently filled by hand and wax-sealed by Florent himself before being put into a handsome French Oak wooden box to await a lucky buyer. For me, it’s a neck and neck race on any given day, whether I like Hampden better than Worthy Park or the other way round, and how Monymusk, Long Pond and New Yarmouth vintages fit into the pantheon (I like to think Appleton exists in a sort of gentler parallel universe than these). Most of the time Hampden has a slight edge in my estimation (though not always), and a rum like this shows why. It provides quite a kick to the palate as well, and very little of the assembly failed in any way, or was diminished over time. It was bottled at 54.1%, and presents a solid series of characteristic Jamaican flavours, being oily, salty, acidic and rough – all at the same time. The crisp and fruity ester-notes do what they always do when left to stand for some hours – become sharp and blade like. But they’re also giving off tastes of damp earth, mustiness, and are just a tad bitter, leavened by white pepper, burnt sugar, caramel and bags of fruits (apples, raisins, unripe mangoes, pears and pineapples). Oh and gherkins in vinegar, some tannins and unsweetened chocolate — not enough to spoil it, but sufficient to take the lead and dominate the softer balancing flavours of vanilla, flowers, and caramel. It’s very distinct and delicious, edging a little over the top, like the Cambridge or TECC from Long Pond was; and it will, I think be appreciated for precisely those reasons. It ended with a flourish, it must be said, really well – long, dry, aromatic, sweet, earthy, with light oil, petrol and rubber notes, plus thyme, and apples. The taste and finish last for hours, it’s that lingering, and I was and remain quite impressed with the way that nearly 34 years of continental ageing didn’t ruin the thing with excessive oakiness. Strictly speaking, I think it’s unfair to categorize or compare independents’ single barrel rums the same way we would something that Christelle Harris or Zan Kong make, something tropically aged that their own hands had touched, blended and made in large batches instead of a couple hundred bottles. Because aside from being made for different audiences, stuff like this is very limited, and exactingly chosen based on the talents and preferences of that single buyer in selecting his casks. In that lies the appeal of the single cask bottling. Still, with the proliferation of the independents and the rise of special limited edition rums over the last twenty years — and the near annual releases of new rums from all the familiar regions by old and new companies — we’re in danger of losing some of that sense of wonder we once felt as we rediscovered those fascinating rums from the 1970s and 1980s that Velier, Samaroli, Moon Imports, Rum Nation, G&M, A.D. Rattray and others were putting out the door. We see bottlings aged ten years, or in their teens, or (heaven forbid) even twenties and take that as a given. But occasionally, just occasionally we get hit by something unexpected. Like the Velier NRJ rums. Like a small Fijian gem from TCRL, or an amazing rum from Antigua Distillery. And like this one, three decades of sweet fire, fury and funk trapped in a bottle, which emphatically demonstrates, like those others do, how some magic still exists in 2018, and can still, with some luck, be found. So now we are the fourth and last ester-boosted rums issued in 2018 by Velier from the distillery of Long Pond in Jamaica, and in a strange way it sums up the preceding three rums in a way that emphasizes many of the best parts and tones down the excesses of all of them. This is all the more curious a statement since it has the highest ester counts of the quartet, and one would expect the massive taste-bomb effluent of the TECA to be jacked up a few notches more…to “12”, maybe. And yet it doesn’t. It’s a really interesting rum. By now the background of this series of rums is covered in the previous three reviews (see other notes below for the recap), so here we can just dive straight in, pausing only to note that this rum is of the category “Continental Flavoured,” has 1500 g/hlpa, the highest of the series, and that would make anyone who already tried the decomposing rhino of the TECA a little cautious. No need. It has many of the same components as the TECA, but more tamed and less intense. Again, it started off with aromas of burlap, wet jute sacks, ammonia and acetones, but while present, they much more restrained than before. Furniture polish, rubber, plastic and whiff of that chewy hogo without going over the top. Oh and the fruits – nice and deep without being either too crisp or too sharp. Peaches in syrup, cherries, ripe apples, spoiling mangoes, caramel, toffee, vegetable soup, sweet soya. See what I mean? – it’s actually rather good if one can get past the meatiness of the background, and the funk and dunder are forceful enough to make a statement for themselves but don’t hog the whole show. The palate was good as well. Strong and sharp, very fruity, with oranges, apples, soursop, unripe strawberries, green grapes and grapefruit offset with softer richer, riper tastes of pineapples and peaches. Vanilla, some very sharp and bitter oaken notes (surpirsing for something so relatively young). You’re still sipping this in the same fragrant hair salon as the TECA — ammonia, nail polish remover, remember those? — but at least it’s not so crowded and the dead dog out back seems to have been removed. Placticene. Also marshmallows, sour cream, and a rather more powerful set of deep musky floral notes than any of the other rums in the series (roses and lilies). Lastly, to finish things off, some licorice and bubble gum, light brine and furniture polish and fruits and funk. All in really good balance, long and fragrant, meaty and chewy without the meat, so to speak. Because of its toned-down but still expressive nature, I’d have to say this high-ester funk bomb is an enjoyable drink and a Jamaican hogo-lover’s dream, without being quite as approachable to general audiences as the Vale Royal or the Cambridge, which I would suggest are better for those who want to dip their toes into the Jamaicans from Velier without taking a bath in the furious tastes that characterize either the TECA or the TECC. Ivar de Laat from Toronto remarked on the TECA as being a reference rum for him, and he’s probably right about that one, but when it comes to really torqued up rums that want to show off the ripped abs of their massive ester levels, I’d suggest the TECC is probably a better one to appreciate. When it comes down to it, my scores reveal something of my opinions on the four NRJ expressions from Long Pond. I liked the Vale Royal and Cambridge a lot; they were tasty and new and gave a nice background to other Jamaican profiles. The TECA will appeal to diehard core rum-junkies, specifically those who really know and love Jamaicans, can’t get enough of da funk and da hogo and want to see things cranked up to the max (you could argue these are the same kinds of people who go nuts over the high-peat-laden Octomores). The TECC on the other hand might actually be the best one to try if you want elements of all of these rums at once. It’s still a flavour bomb, quite meaty, just not at the level of its older brother. The audience for the four rums will, I think, be divided into two similar groupings. The easy drinkers and Velier collectors will inevitably be drawn to the first two, the Vale Royal and the Cambridge. Those who have been following Velier for years and sense what Luca has done may well prefer the latter two rums because they will be seen for what they are, examples of reference rums for Jamaica based on near highest ester counts available. Neither side will be right, or wrong. So, clearing away the dishes: as I noted in the first review (the Vale Royal) these four rums are useful to drink as a quartert, one after the other, because they provide insight into how esters can (and do) impact the Jamaican profile (which is not to take away anything from either Hampden or Worthy Park, both of which indulge themselves in similar pursuits). That caution need be exercised is probably a superfluous point to make, not just because of the strength of the rums (62.5%), but because different components of the chemicals provide very different tastes and not all those would be to the liking of everyone. Personally, I think the four NRJ expressions are among the most unique rums ever to come out of Jamaica, running the gamut from drinkable to formidable to certifiable. When Richard Seale remarked a few months ago that the DOK-level rums are not for drinking straight but are meant as flavouring agents, he knew exactly what he was talking about and I can only confirm that these are poster children for the concept. Like the clairins issued back in 2014, these are meant (I believe) to prove a point, not to please the greatest number of rum drinkers (pointless anyway, given their limited outturn) or to show off a blender’s skill (the ECS series have dibs on that already and in any case these are pure pot still rums, not pot/column blends) – they’re a showcase of what Jamaican rums can be. That doesn’t necessarily make them good for everyone (or the best), but man, are they ever original. I can truly and with some emphasis say that I’ve not tried their like before. And truth to tell, we need original in this world of bland retreads, we need exciting rums, new rums, different rums, made by courageous people who are willing to go right out into the screaming edge of rum production. Such people demonstrate – for good or ill – how varied rums can be, and deserve praise and encouragement, even if we shudder sometimes and draw back from some of their more excessive outturns. I think what Luca was going for here was not a sipping rum at all – he said as much in an off hand comment in London not too long ago. What he was aiming at was education and demonstration (of both hogo and Long Pond) as well as a sort of fiendish delight in issuing yet another set of rums we haven’t yet seen much of. Has he succeeded? I think so. Leaders in any field must bridge the divide between their personal vision and their adherents’ experiences: bend too far towards the former and one risks losing the audience entirely, tilting too far the other way just makes for more of the same old blah. 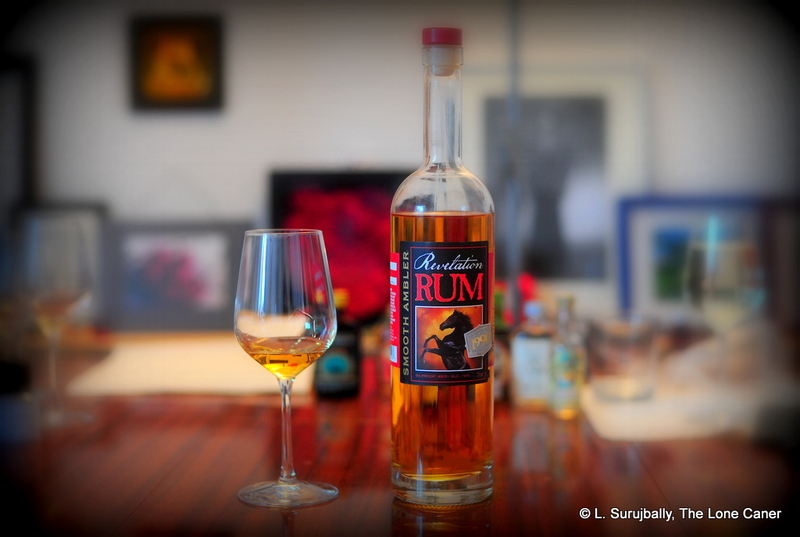 I think these rums straddle the uneasy space between those two ideals in a way that is nothing short of impressive. In brief, these are all rums from Long Pond distillery, and represent distillates with varying levels of esters (I have elected to go in the direction of lowest ester count → highest, in these reviews). Much of the background has been covered already by two people: the Cocktail Wonk himself with his Jamaican estate profiles and related writings, and the first guy through the gate on the four rums, Flo Redbeard of Barrel Aged Thoughts, who has written extensively on them all (in German) in October 2018. As a bonus, note that a bunch of guys sampled and briefly reviewed all four on Rumboom (again, in German) the same week as my own reviews came out, for those who want some comparisons. These are definitions of ester counts, and while most rums issued in the last ten years make no mention of such statistics, it seems to be a coming thing based on its increasing visibility in marketing and labelling: right now most of this comes from Jamaica, but Reunion’s Savanna also has started mentioning it in its Grand Arôme line of rums. 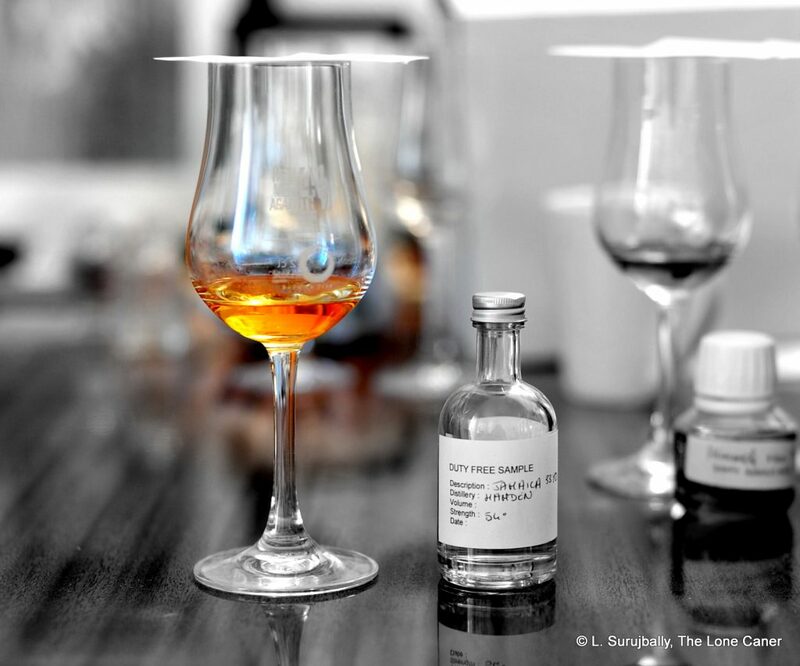 For those who are coming into this subject cold, esters are the chemical compounds responsible for much of a given rum’s flowery and fruity flavours – they are measured in grams per hectoliter of pure alcohol, a hectoliter being 100 liters; a light Cuban style rum can have as little as 20 g/hlpa while an ester gorilla like the DOK can go right up to the legal max of 1600 at which point it’s no longer much of a drinker’s rum, but a flavouring agent for lesser rums. (For good background reading, check out the Wonk’s work on Jamaican funk, here). Exactly who came up with the naming nomenclature, or what those names mean, is something of a historian’s dilemma, and what they call the juice between 301 to 699 gr/hlpa is not noted, but if anyone knows more, drop me a line and I’ll add the info. Note in particular that these counts reflect the esters after distillation but before ageing, so a chemical test might find a differing value if checked after many years’ rest in a barrel. Long Pond itself sliced and diced and came up with their own ester subdivisions, and the inference seems to be that the initials probably refer to distilleries and estates acquired over the decades, if not centuries. It would also appear that the ester counts on the four bottles do indeed reflect Long Pond’s system, not the standard notation (tables. It’s unclear whether the TECC stands for Tilston Estate, one of the estates that got subsumed into Long Pond in the wave of consolidations in the 1940s and 1950s (this is the theory to which Luca subscribes), or for Trelawny Estates, the umbrella company created in the 1950s before being taken over by the Government and renamed National Rums of Jamaica. This is where some additional research is needed – nobody has written (so far) on the meaning of the “CC”, though given the Long Pond marks listed above, it’s reasonable to suppose it’s Tilston/Trelawny Estate, Continental Type C (as opposed to “A” or “B” with progressively higher ester levels. The various histories of Long Pond written by Barrel Aged Thoughts, the Cocktail Wonk and DuRhum provide useful background reading, though they do not settle the mark designation issue conclusively one way or the other. 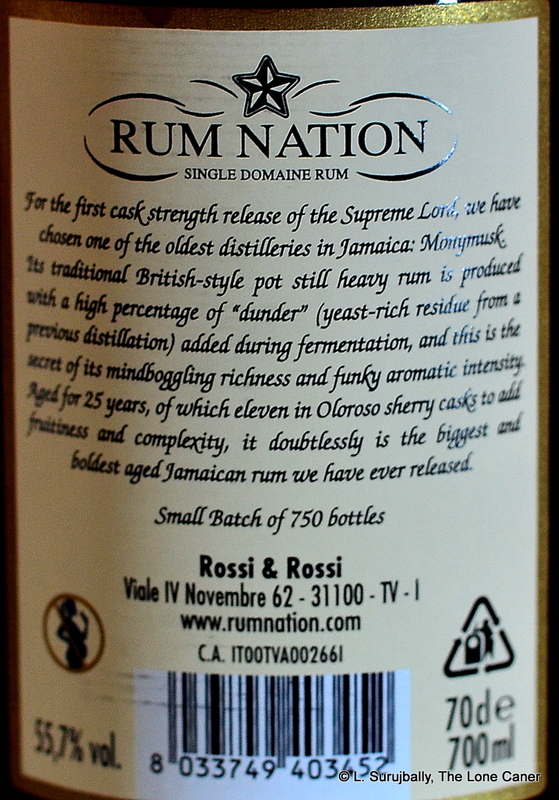 Note: National Rums of Jamaica is not an estate or a distillery in and of itself, but is an umbrella company owned by three organizations: the Jamaican Government, Maison Ferrand of France (who got their stake in 2017 when they bought WIRD in Barbados, the original holder of the share Ferrand now hold) and Guyana’s DDL.